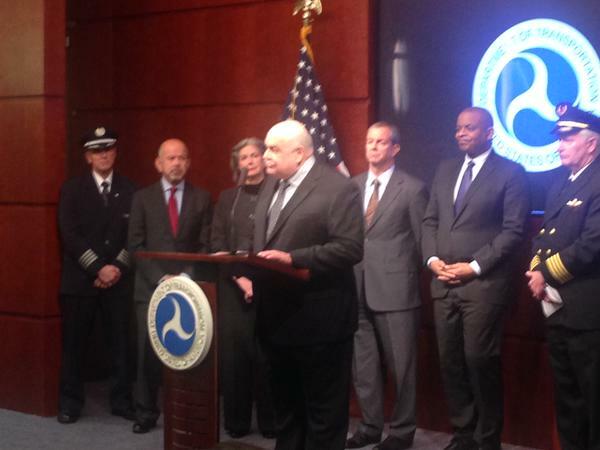 WASHINGTON – U.S. Transportation Secretary Anthony Foxx and FAA Administrator Michael Huerta today announced the creation of a task force to develop recommendations for a registration process for Unmanned Aircraft Systems (UAS). The task force will be composed of 25 to 30 diverse representatives from the UAS and manned aviation industries, the federal government, and other stakeholders. The group will advise the Department on which aircraft should be exempt from registration due to a low safety risk, including toys and certain other small UAS. The task force also will explore options for a streamlined system that would make registration less burdensome for commercial UAS operators. The task force may make additional safety recommendations as it deems appropriate. Secretary Foxx directed the group to deliver its report by Nov. 20. “Registering unmanned aircraft will help build a culture of accountability and responsibility, especially with new users who have no experience operating in the U.S. aviation system,” Foxx said. “It will help protect public safety in the air and on the ground.” Every day, the FAA receives reports of potentially unsafe UAS operations. Pilot sightings of UAS doubled between 2014 and 2015. The reports ranged from incidents at major sporting events and flights near manned aircraft, to interference with wildfire operations. “These reports signal a troubling trend,” Huerta said. While the task force does its work, the FAA will continue its aggressive education and outreach efforts, including the “Know Before You Fly” campaign and “No Drone Zone” initiatives with the nation’s busiest airports. The agency also will continue to take strong enforcement action against egregious violators. At the same time, it will continue working with stakeholders to improve safety to ensure further integration and innovation in this promising segment of aviation. There are a ton of people who do not want to see this passed, and after a certain number of signatures the government is legally obligated to respond. Petitions have had quite a lot of clout in the past its worth a shot. Yeah, I don't see a petition working here. Civil disobedience. Refuse to register. The program will fail if no one will do it. Sorry you are correct it is not in the current Liberal policy. Guns not a huge issue for me so not 100% up to speed. With respect to your comment we can debate if the registry had time to prove itself on gun related site. Much respect Rob Lefebvre as a Canadian developer of APM. Unfortunately it is a fraction of 1% of people flying that causes these issues to be regulated. A very small fraction. I'm stayin calm and waiting for the end of November. This is just something the sUAV community is going to deal with like it or not. Petitions, taking up arms, or whatever, will make no difference. That's my opinion like it or not. How is this an "Emergency", when drones have created NO real problems, while there are multiple gun murders every day in my city. And I own several guns. I have not had to register ANY of them. They are designed for killing people, and I am free to buy them in my state w/out ANY sort of registration at all. I'll also mention, I saw several copter frames on the market, which are silver... And I was thinking, why would I want a silver copter, when I wouldn't be able to see it in the sky. I guess I have my answer now. I also want to say, if anyone has dropped the ball in this situation, it's the companies selling drones. Every other industry has lobbyists pushing for their interests. DJI should send some people over here, and 3DR should have been political for the past several years. Apparently DJI has billions to lose, and 3DR, millions. The Consumer Electronics Association (CEA) is the technology trade association representing the $285 billion U.S. consumer electronics industry. More than 2,000 companies enjoy the benefits of CEA membership, including legislative and regulatory advocacy, market research, technical training and education, industry promotion, standards development and the fostering of business and strategic relationships.